As the heart of French speaking Canada, Quebec is home to two of the biggest cities and some of the most spectacular scenery in the country. It is the second most populous province and the only in which French is spoken by the majority. This is a key consideration as most schools and businesses use French as the predominant language. There are good opportunities within the region and the provincial government is currently investing heavily in tourism, energy and mining. Living costs are fairly reasonable, particularly when compared with its western neighbour Ontario. Quebec is an ideal choice for anyone looking to immerse themselves in Canada’s French culture and explore the countries natural beauty. On the banks of the St Lawrence River, the historic capital of Quebec City is one of the oldest cities in North America. The beautiful Old Town is a UNESCO World heritage site and the city is surrounded by stunning lakes, rivers and mountains. It is no surprise that the city’s tourism industry is booming but it is also a key centre of technology and science. Quebec’s largest city is a bustling, cosmopolitan place where French culture and gastronomy combine with Canadian modernity. Montreal is a relatively inexpensive city yet offers great opportunities in areas as diverse as engineering, finance and the arts. There is also a thriving cultural scene with exhibitions, concerts and festivals for every age and taste. Gatineau is pretty town in the west of the province and, along with Ottawa, forms the National Capital Region. Its proximity to the country’s capital mean there are plenty of opportunities, particularly in the public sector. Gatineau is surrounded by picturesque countryside with parkland, lakes and hills right on the doorstep. Located on the Ile Jesus just northwest of Montreal, Laval is home to a vibrant arts scene and packed with unique shops and restaurants. As a neighbour of Montreal, the city has a robust economy and strong technology and retail sectors. Laval is an excellent choice for families moving to Quebec with good schools and easy commuting as well as the fantastic Thousand Island River Park. The car is the most popular mode of transport around Quebec, with towns and cities easily accessible by the regions roads and highways. Via Rail Canada is Quebec’s only intercity passenger train service with routes to many major towns and cities. Bus networks run across most of Quebec’s cities and the Montreal area also has a commuter train service run by AMT. Quebec has several international airports of which Montreal-Pierre Elliott Trudeau and Quebec City Jean Lesage are the busiest. From the pristine gardens of the city parks to the rugged wilderness of the national parks, there are miles of open space to discover in Quebec. In the heart of the Laurentian Mountains, Mauricie National Park boasts some of Quebec’s most spectacular scenery with forests, mountains, lakes and waterfalls. This mountain range also has some fantastic ski areas, in particular the exhilarating runs around the picturesque village of Mont-Tremblant. Charlevoix is another beautiful area with pretty villages nestled in stunning coves and the nearby Saguenay Fjord rivals Norway for its dramatic landscape. If you want to guarantee a wild encounter, head to Omega Park wilderness reserve where you can drive, ski or hike amongst wolves, moose, artic foxes and otters. 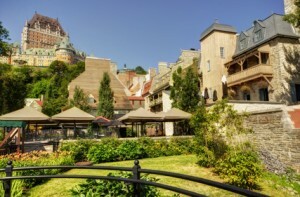 Montreal has some of Canada’s best restaurants as well as the magnificent Notre-Dame Basilica and Montreal Biosphere. The historic ramparts and charming streets of Quebec City’s Old Town are a wonderful way of discovering Canada’s heritage. The annual Winter Carnival in Quebec City is another uniquely Québécois experience, with sleigh rides, parades, snow slides, ice skating and canoe racing. There are over a million lakes in Quebec and thousands of waterways. 80% of Québécois live on the shores of the Saint Lawrence River that runs through South Quebec. 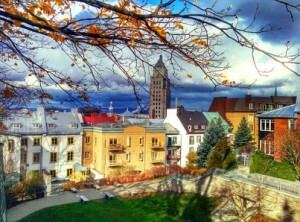 Quebec City is the only walled city in North America. The historic walls date back to the 17th Century.